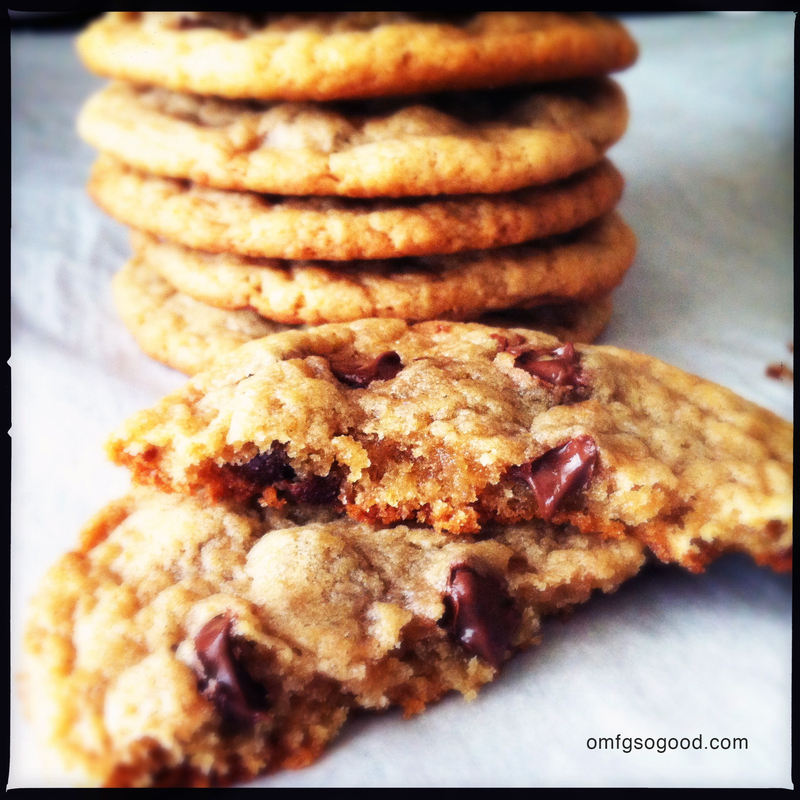 peanut butter banana chocolate chip cookies | omfg. so good. Little Charley is currently obsessed with the Cookie Monster parody of the pop song “Call Me Maybe.” So much that I will never get it out of my head. It’s like a freshly baked ear worm. I just met you. And this is crazy. But you got cookie. So share it maybe. Now here’s where I give you something you can truly thank me for. 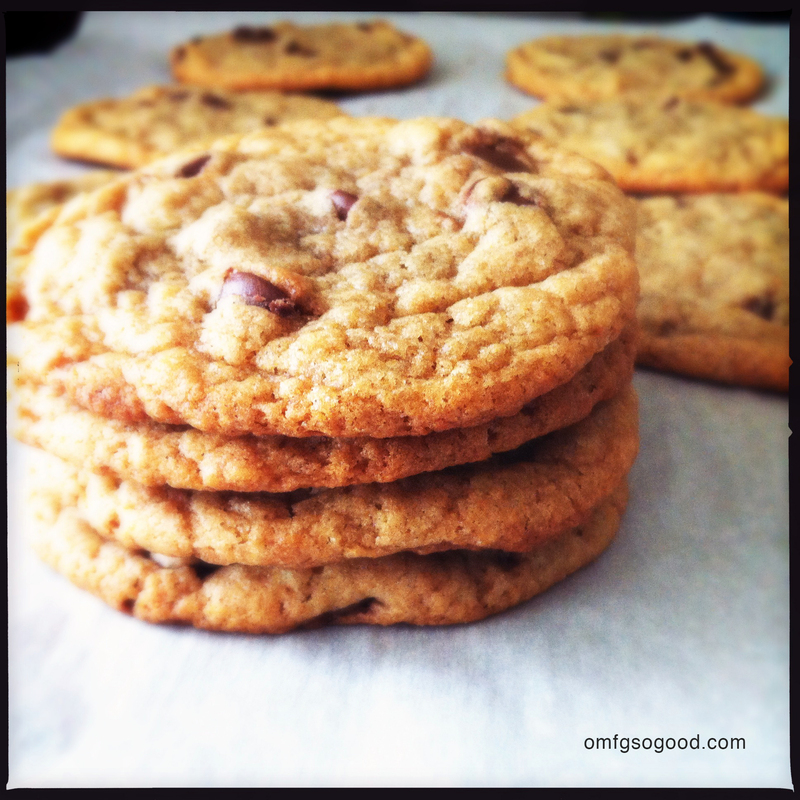 The recipe for these delicious Peanut Butter Banana Chocolate Chip Cookies. I found the original recipe on one of my favorite food blogs, howsweeteats.com, and adapted it just a smidge. 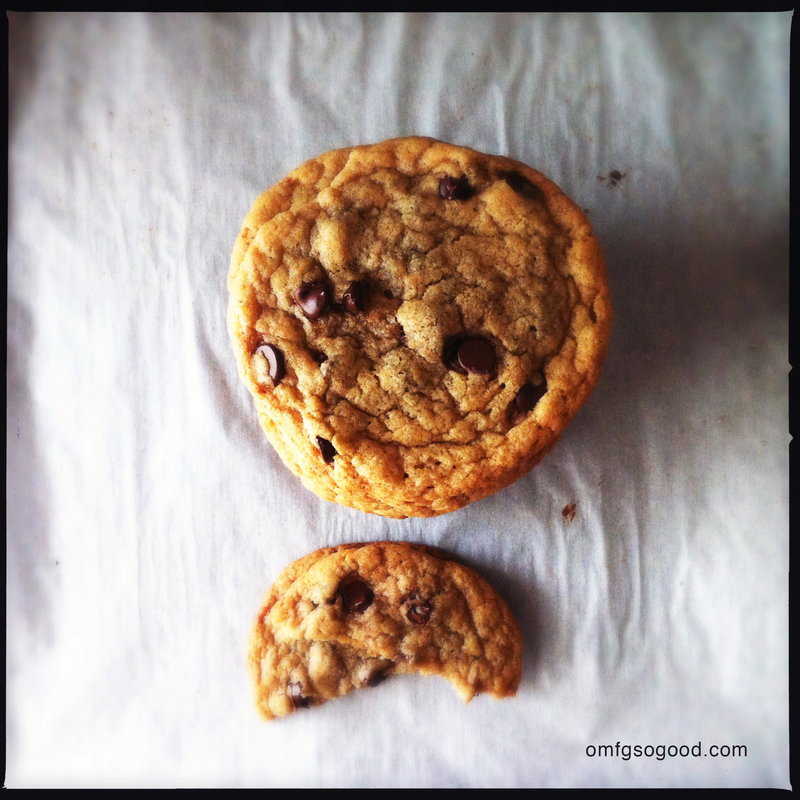 It’s like an everyday chocolate chip cookie snuck into a phone booth and emerged as SUPER COOKIE. Sweet, buttery, crispy and chewy… with a tiny punch of fruity. Now that’s what I call super power. *Trust me. This combination gives the cookies a fantastic crispy outside/chewy inside that can’t be achieved with a standard all-purpose flour alone. Preheat oven to 325 degrees. Line two sheet pans with parchment paper and set aside. In a small mixing bowl, sift together flours, baking soda and salt. In a separate mixing bowl, cream together butter and peanut butter. Add both sugars and mix until combined and fluffy. Add in egg yolk and vanilla and mix until combined. Add in the mashed banana and mix to combine. Add half of the dry ingredients and mix to combine then add in the rest, again mixing to combine. Fold in the chocolate chips with a wooden spoon. Form the dough into 1.5″ balls and place on the prepared sheet pans at least 2″ apart. Bake for 12 – 14 minutes or until the edges are golden brown and the middles are still soft. DON’T OVER COOK. Remove from the oven and cool on the pans on wire racks then transfer to wire racks to cool completely before storing. And, like all classic super heroes (Han Solo, Superman, Captain America, Super Grover), these cookies freeze well. So, if for some odd reason you have left-overs after the first few days, don’t be afraid to store them in single layers in freezer bags and pop them into the old freezer. Yes, I said Super Grover. I had to figure out a way to tie the super hero commentary back to Cookie Monster. I know, I know. It’s a gift.